Recently, I created visual routines for my three and a half year old, in order to ease our transition into a more intentional, ordered lifestyle. Much changed nine months ago when we had our second baby, and since then, everyday things have been a bit hard on our daughter. By creating a visual routine and adding more structure to our daily lives, I hope to accomplish more and do it more quickly without her balking or feeling insecure during transitional times. So far, it’s an instant hit. She has so much fun following the routines and schedule! 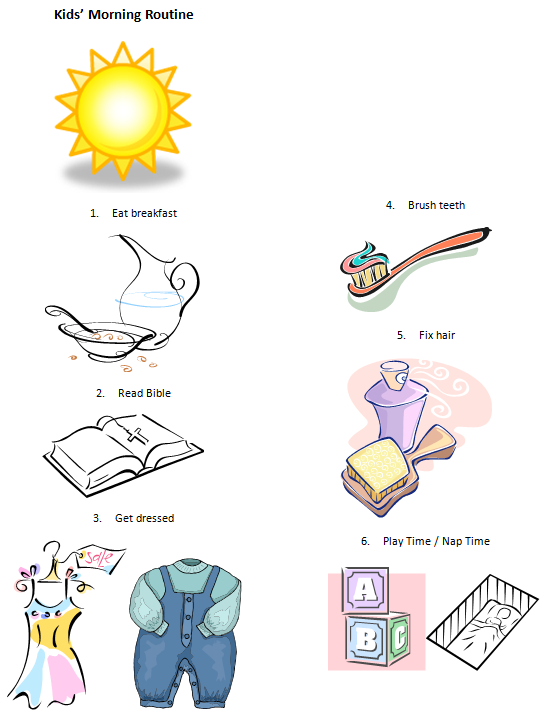 I put the day’s schedule together each morning with the help of my preschooler. She enjoys the activity, and it introduces her to the flow of that day first thing. She has learned what each icon means very quickly, and it helps that some are very obvious. 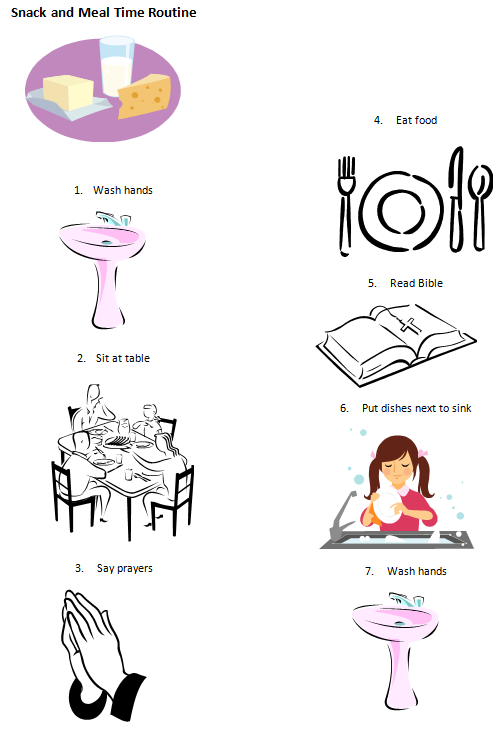 Most remarkable has been her sudden willingness to wash her hands before meals, because of the pink sink on the routine! She loves that pink sink. Previously, it was a battle to get her hands washed before eating. I created one routine for meal times and snack times, one for morning time, and one for evening. I kept them very simple, and used clip art from my word processor so it only took a few minutes. 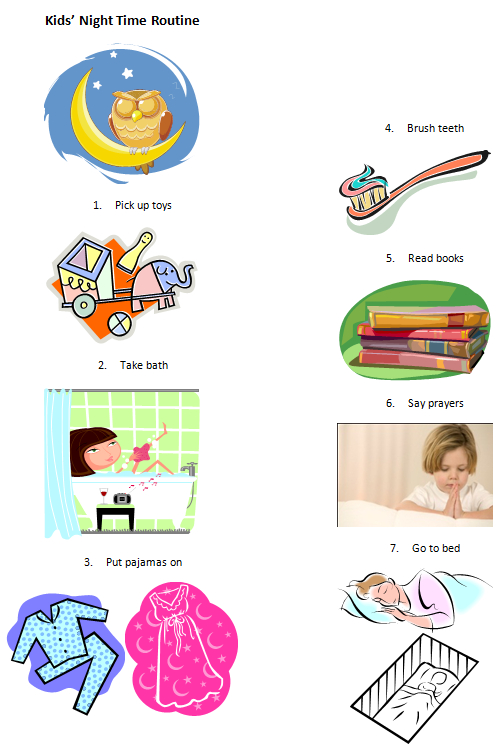 The morning and evening routines are posted on each child’s bedroom door, as well as on the fridge (with the meal time routine) for easy reference. Each routine has an icon to denote the type of routine at the top, followed by an icon for each activity. The schedule was inspired by “How a Visual Schedule is Bringing Order to Our Home” at Keeper of the Home. It turned out to be slightly more complex to create, because I wasn’t entirely satisfied with my first attempt at making a visual schedule for free, using materials on hand. I already had a magnetic whiteboard that wasn’t in use, so rather than buy a pocket wall chart of some kind, I used it with some larger icons I had printed from my word processor. 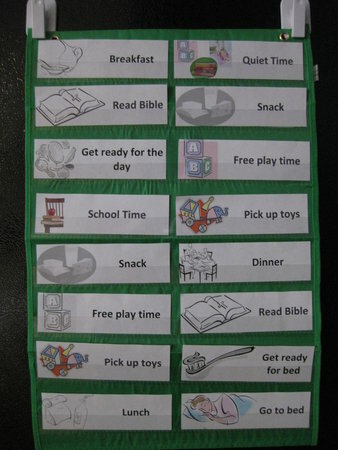 Then, yesterday, I found a pocket chart scheduler in the $1 bins at Target! I was so excited. It is small and very cheaply made, but for $1 I’m not complaining. It is much easier, and I don’t have to worry about a choking hazard from the small magnets. I also prefer the format with titles next to the icons – even though I know what each picture stands for, I prefer to have something to read. For some reason, it clarifies things for me and I actually have to think about it less. 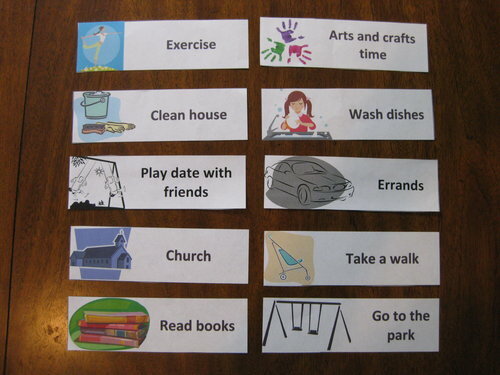 I used the same clip art that I had on the routines for continuity, plus some additional clip art for items that were not a part of the routines. Unfortunately, I ran out of ink in my color printer partway through the printing process, so some of the icons are black and white instead of color. I’ll have that fixed once the technical expert of the household has a chance to change my printer cartridges! No, that isn’t just bad photography, the seams really are crooked. But it definitely serves its purpose – my toddler certainly doesn’t care about the straightness of the seams! We go down one column, then start the next as I thought that going strictly left to right might confuse a non-reader. I couldn’t get a full picture because it is hanging in a narrow hallway, but you can get the gist from this picture. 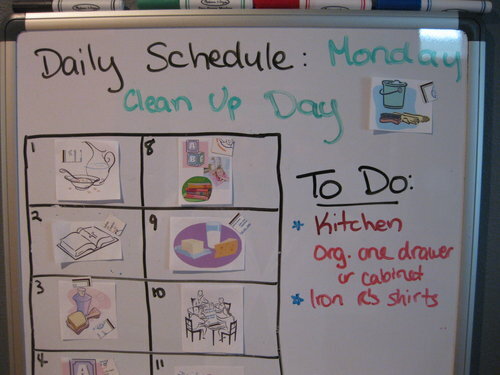 I’ll keep the whiteboard up for my own use, and add a spot for today’s meals in addition to the to do list. Simple, easy to create, and effective!